Bringing a Trained Guard Dog inside the Shark Tank is risky enough, but then commanding it to attack onstage, we'll, you best know exactly what you're doing. Fortunately, Wade and Lori Morrel, the owners of Priority One Canine, run a Guard Dog Training Business using the most experienced trainers in the world. In fact, Priority One K-9 is where dog trainers also get trained mostly by experienced police and military canine teachers. All the guard dogs trained by Priority One Canine are first and foremost a well-trained family pet. The majority of canines don't have the necessary temperament required to become a well-trained family protector, but the few that do, are hand-chosen to become part of this elite team. None of these dogs will ever be locked inside a kennel when training's over for the day, but instead go home with the trainer's and live with their Family as a pet. This brings a whole new meaning to bringing your work home with you. It also clearly shows a level of commitment and a true passion the Morrel's have for this unique business coming in Shark Tank's Veterans Episode #608. The German Shepard has always been a popular breed training for a guard do, and the most requested by families wanting a well-trained pet with special abilities. 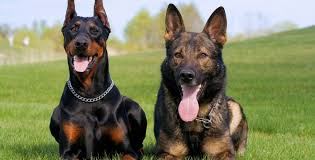 Priority One Canine Elite Trainers have a combined 200 years worth of experience working with German Shepard's, Dutch Shepherds, Belgian Malinois, Giant Schnauzers, Rottweiler’s and Doberman Pincher's. I'd imagine this former Marine, and other experienced trainers with Military and Police Dog units, could train about any breed they want to, but these breeds have proven to be the most reliable. Now if you're thinking Wade and Lori Morrel have been training hundreds of family guard dogs to sell after their appearance on the Shark Tank Show, keep thinking, because that's not how the process works. First off you'll need to pass a background check before selling you a highly trained security dog capable of unimaginable things in the wrong hands. The next step is finding the few dogs with the right temperament meeting Priority 1 Canines strict requirements. 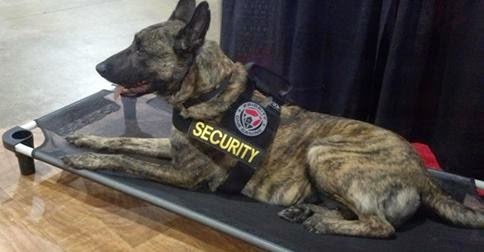 Just because the new guard dog candidate may have first shown potential, doesn't mean it will successfully be certified as a Priority One Canine Security Dog. On the FAQ page of Priority One Canines website, the question says, "How do I start the process of owning one of your dogs"? The actual process can take from 3 to six months just for the training part of your new best friend. It also says to contact them to get on the waiting list, which I assume, will be growing substantially after Shark Tank Fans become aware of the benefits owning a professionally trained dog. This biggest question most people would have is "How much does a professionally trained family guard dog cost from Priority One K-9?" Considering all the variables involved just picking the right dog to start training, the price range is between $15,000.00 to $45,000.00 each. That may sound like a lot of money, and it is, but in return you'll have one of the most highly trained dogs on this earth. As far as getting a deal on the Shark Tank, Priority 1 Canine seems to be in a class all by itself as there's no other business model to compare with past contestants. It's not like the Morrel's can receive orders for 1000 family security dogs after Shark Tank Episode 608 airs this Friday night, and expect to deliver without a very long extended period of waiting time. Even these Best Dog Whisperer's who are highly trained in the guard dog business, can only do so much on any given day. The Sharks usually like products/ businesses that can be scaled-up as demand rises, but how do you scale-up finding that many quality dogs with the right temperament for this type of specialized training? If these dogs are so well trained, why did the dog on the show need to have a shock collar on? They tried to hide it with a scarf but it was most definitely a shock collar, something trainers will often use to "correct" a dog that doesn't obey a command. I wonder how long it will be before they get sued when a dog bites someone they shouldn't. Just like your comment, accidents happen and to protect the crew, cast and insurance policy, it was instructed by Shark Tank lawyers to; ABC, to have the shock collar in place. We live in a sue or be sued society and it is one thing to ask a Shark for money. Another to be sued by one; duh!